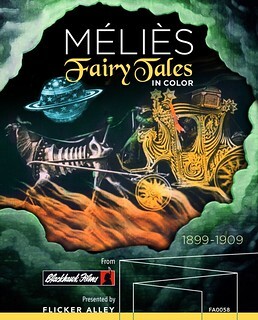 His latest US release is Méliès Fairy Tales in Color, a set of hand-tinted Méliès films from 4K scans of original prints, available now from Flicker Alley. We start by talking about that set, but go on to cover many other projects he's been involved with, many in partnership with the late David Shepard, including films by Charlie Chaplin, Buster Keaton, Cecil B. DeMille's King of Kings, and more. Another great episode, Mike! Hearing zbromberg gives people who have never had the pleasure of seeing one of his shows understand why he is such a great force in our hobby: his enthusiasm is clear in every sentence. Please remember to post a link to his Kickstarter for the train films in Nitrateville. I love what you said about the fact that these Melies films inspire kids because they can see how it was done and they know they could do that too. I never thought of it that way but you're absolutely right. Something about the simplicity of it is more inspiring than some of the more elaborate and expensive effects today. I also never considered the fact that people in the early days of movie-going were at the risk of catching fleas/bed bugs and at the very least smelling some nasty odors and sitting on hard chairs. When people say I was born in the wrong era, I always tell them I'm grateful to live in an era where so many films are accessible and I have the time to watch them. Now I can add the theater experience to the list. That story about the discovery of the alternate version of The Blacksmith will go down in archival history. You couldn't invent something like that. I can still hardly believe it happened. What a great episode! I was very excited to hear about Lobster's upcoming restoration of "Danger Lights"(1930). I wonder if the Library of Congress holds 70mm material on this film? Isn't that where the wide screen 70mm version of "The Big Trail the film was found? And the campaign has opened. If you're as excited as realist, or simply want to help out, head over to the Crowdfunding section! Serge comes across - again - much like David Shepard: a mix of love for the material with common sense.